Each year, the Minnesota Department of Health (MDH) tests approximately 2,000 wild or domestic animals for rabies and on average 40 to 100 animals test positive. Rabies is a fatal neurologic disease caused by a virus that is spread through saliva. Typically the virus is spread when a rabid animal bites another animal or human. During January – July 2013, 39 rabid animals were identified in Minnesota. 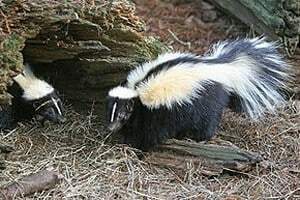 Most of these rabid animals were found in rural parts of the state where it is more common to find skunks, which are the wildlife reservoir for rabies. Twelve (31%) were found on farms raising crops or animals. These rabid animals included eight skunks, one calf, one horse, one goat, and one bat. Ten people exposed on these farms were recommended to get rabies shots. Other animals, including cattle, sheep, lambs, horses, dogs, and cats on these farms were also potentially exposed to the rabid animals. Here is a sampling of stories detailing challenges farmers have faced. A rabid skunk got into the cow pen where a cow stepped on it and in the process was bit on the foot. The Minnesota Board of Animal Health (BAH) determined that no other herdmates were exposed. A rabid skunk came into a barn while ewes were lambing. As the farmer was running to get her gun, the skunk made it into a pen; the ewe tried to fight the skunk off but it managed to bite a newborn lamb. This lamb was euthanized, two ewes were placed under quarantine by BAH and 433 sheep were put under observation. Both ewes were released from quarantine in May. A male goat had a swollen back leg and was exhibiting neurologic signs (stiff gait, twitching, and acting scared) prior to its death. The animal tested positive for rabies. Earlier that same week another male goat had died with similar signs but was not tested for rabies. The owners recalled smelling a skunk on the property a few weeks prior to the goats dying. The BAH put 129 goats under observation on the farm and none were quarantined. Their goat was the first rabid goat reported in Minnesota since 2004. One person received the rabies shots after being exposed to the goat. A farmer’s bottle fed calf refused to eat and drink. This farmer had a rabid calf 22 years prior and suspected this calf also had rabies. His astute observation prompted him to get the calf tested for rabies (it was positive) and allowed MDH to follow up with the family to make sure everyone received proper treatment, if needed. Eight people received rabies shots. The farm had 35 head of cattle put under observation by BAH. A rabid horse resulted in four head of cattle and one additional horse being put under observation by BAH. Neither horse had been vaccinated against rabies. The owner of the horse received rabies shots because he had been caring for the horse while it was showing signs of rabies. Rabid skunks are the primary threat to livestock on Midwestern farms, but remember, bats are also a reservoir for rabies and are most active during August and September in Minnesota. So far this year, almost one third of rabies positive animals have been found on farms, so it is important for farmers to be aware of the risk. The skunk or wild animal should be killed and submitted for rabies testing. Don’t shoot the animal in the head because the brain is needed for the rabies test. Work with your veterinarian to have the animal submitted for rabies testing. Consult your healthcare provider or health department regarding your concerns about exposure to the animal. Consult your veterinarian regarding any concerns you have for your animals. Bat exposure is a special story. 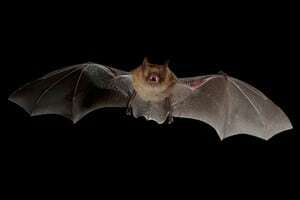 If anyone has physical contact with a bat, is bitten by a bat, or wakes up to a bat in their bedroom, it should be captured and submitted for rabies testing. They have very small teeth and you may not notice a bite. Rabid animals are a risk to you and your family’s health, as well as the health and well-being of your livestock and pets. Vaccinating your pets and prize cattle, sheep, and horses against rabies can help protect the animals and people on your farm. If you have any animal rabies questions please contact your local veterinarian or the Minnesota Board of Animal Health at 651.201.6808. 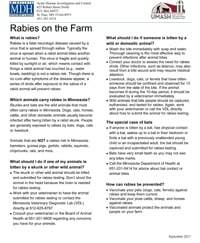 If you have any rabies questions related to human health please contact your healthcare provider or the Minnesota Department of Health at 651.201.5414. You can also find more information about rabies at www.health.state.mn.us, keyword: rabies. If you are outside of Minnesota, please consult your state health department for specific state recommendations and procedures on rabies.